Nanyin simply means, music of the south. 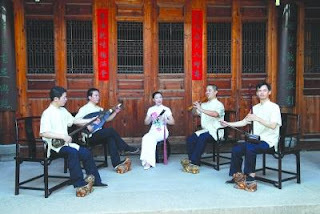 It is the traditional folk music that is now endemic to the Fujian province of China especially around Quanzhou and Xiamen, as well as other areas around Asia in which large numbers of Min Nan (閩南) people have emigrated to such as Taiwan, Indonesia, the Philippines, Hong Kong, Malaysia and Singapore. Nanyin is a very ancient musical form. Exactly from which point can Nanyin be traced back to is still a topic of great debate among scholars. There are a few differing views, but most of them agree on the fact that the birth of Nanyin probably originate from long before the Tang Dynasty. During the Tang and Song Dynasties, Nanyin developed, slowly becoming more and more like the form we see now. It was from the Yuan and Ming Dynasties that saw the flourish of Nanyin, and its maturation. During the Tang and Song Dynasties, refined court music was performed by musicians under the employment of the royalty during the prosperous times. In the tumultuous wars as powers were exchanged, these court musicians had to flee to the south. They brought with them, the refined music of the courts, to the Min Nan areas in which they settled in. Over the years, these refined court music became a staple for the common people in this area and Nanyin took its roots firmly in this area. There are 4 melodic instruments in Nanyin music. As seen from left to right in the picture, the sanxian (三弦), pipa (琵琶), the singer, the dongxiao (洞簫) and the erxian (二弦). The sanxian and the pipa are different from the sanxian and pipa used in Chinese Orchestras. The pipa has a curved neck and unlike the northern pipa, is not chromatic. Likewise, the sanxian is smaller and has a gentler tone than the big sanxian. These two instruments also use the nylon string which gives a different sound than the metal strings that are seen in modern Chinese orchestral instruments. The dongxiao and the erxian are also different from the xiao and the erhu that are used in the orchestra. The dongxiao has a different blow-hole. The erxian is constructed somewhat differently from the erhu we know and it uses silk strings which gives a different sound although some modern erxians are fixed with metal strings nowadays. In the ensemble, the pipa and the sanxian play the skeletal notes, providing the basis of the melody and rhythm, while the dongxiao and the erxian decorate the melody. There are 3 main genres in Nanyin music. These are the zhi (指), pu (譜) and qu (曲). The zhi has music and lyrics and comprises several movements. The tempo of the movements usually run from slow to fast. Although there is accompanying lyrics, the zhi can be performed with only the instrumental parts. Certain movements can also be taken out on its own and performed, with or without the singing. The pu is a work in several movements as well. Unlike the zhi, the movements in the pu are joined in a unifying idea. The pu is for instrumental performance only, and has only the pipa performance instructions and no lyrics. Qu are the collection of separate little songs. They are usually sung, unlike the zhi, together with instrumental accompaniment. A traditional Nanyin performance of 風打梨, a movement within a zhi. This is a new composition, utilizing nanyin elements accompanying a modern Liyuan opera. Zheng Chang Ling, Wang Shan. Nanyin "南音". Hangzhou: Zhejiang Renmin Chu Ban She, 2004.